And just like that....my 9 days off is over. I am truly thankful for the time I had though. I was able to get so many things done and checked off my list. I wanted to thank you all for the sweet comments you left about my dining room Christmas decor. You are the sweetest! Today I am sharing my kitchen decor which is also pretty simple. Again I used fresh greenery and a few things I had in my house. I love the simplicity of it. These are the shelves to the left of my kitchen sink. Just a few pops of red and green does the trick. 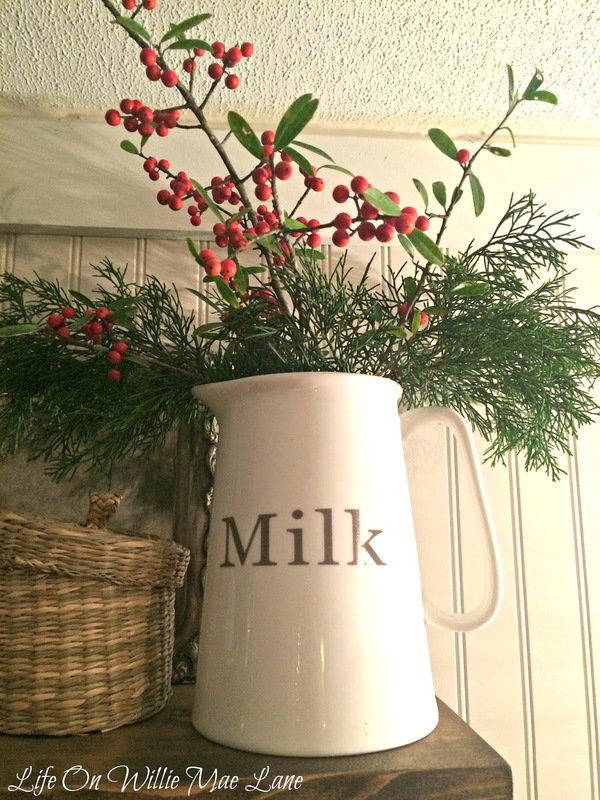 Love the fresh cedar and berry branches in my milk pitcher. 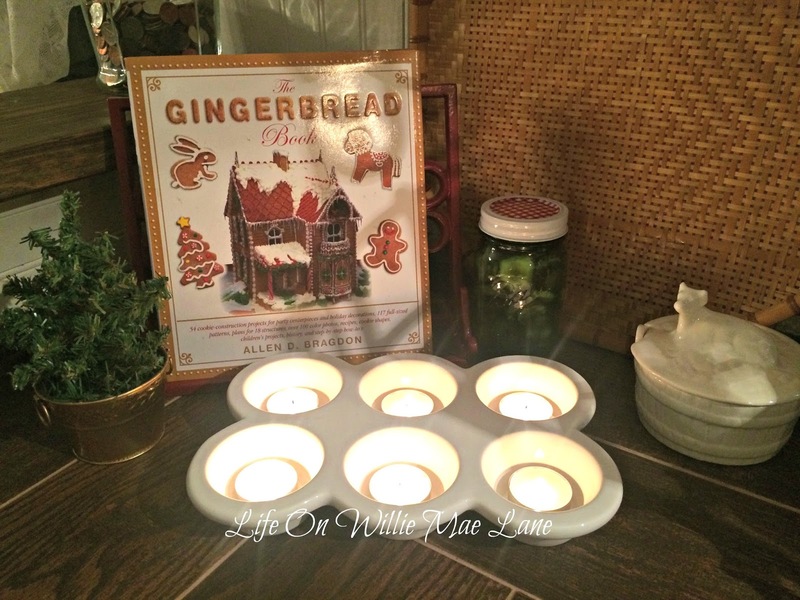 My ironstone muffin pan looks so pretty with tea lights in it. 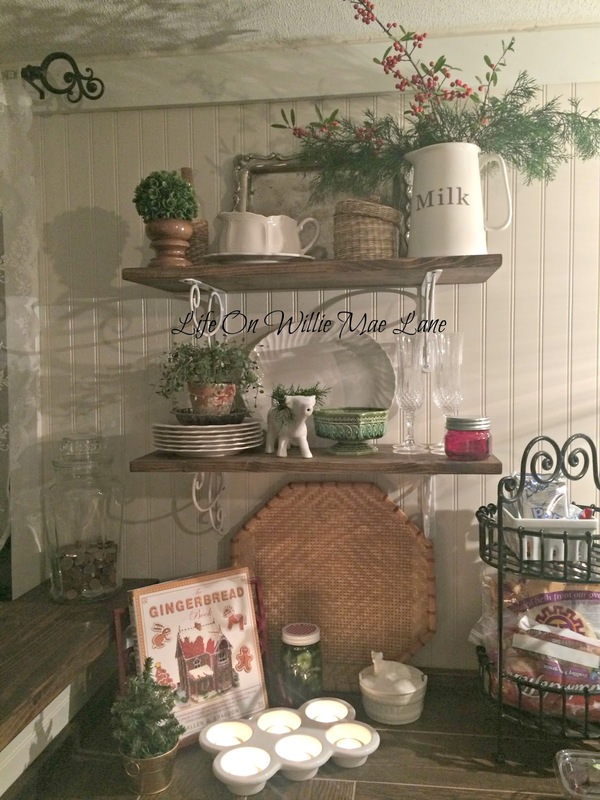 A gingerbread cookbook and the tiny tree I got from my mother-in-law's craft shop completes this corner. 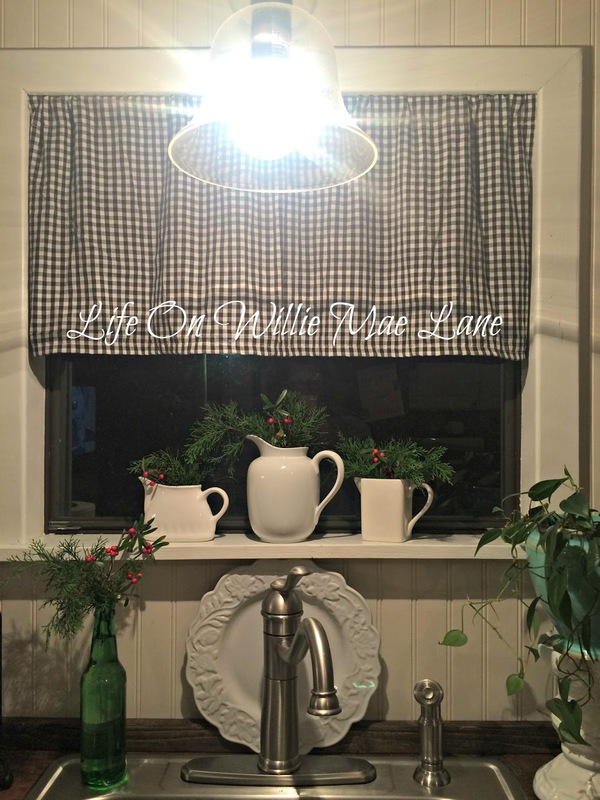 The window holds three of my small pitchers and creamers filled with fresh greenery as does the green bottle on the sink. I made a new curtain with the black and white gingham I also got from my mother-in-law. So pretty! I like the reflection of the tree lights in the window glass. To the right of the sink are my other two shelves. Again, just a few red and green pops of color. The hand print plate is Dakota's from 3rd grade. He was in 3rd grade the year I started teaching and I made these with my class using paint for porcelain that is baked on and food safe. I tried it out with him before I made them in my class. 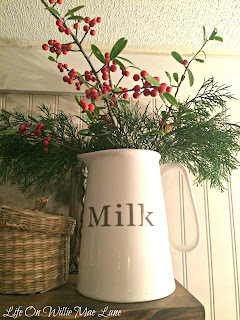 I added some red and green peppermint look paper straws in a little milk jug and stacked two of my red jars from Target. 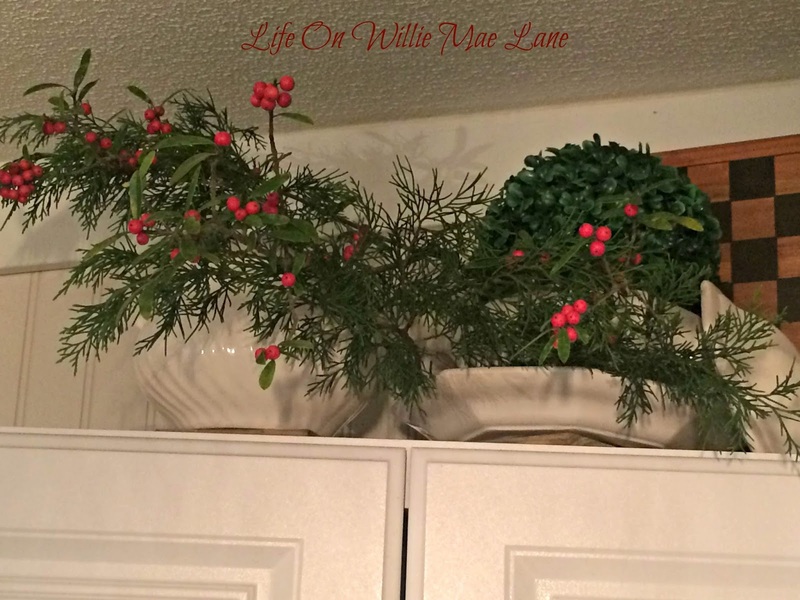 The other side of the kitchen just got some greenery on top of the cabinets. I also put some Christmas recipe books in the corner. 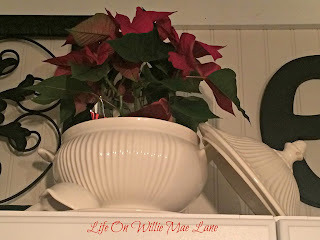 I hope the poinsettia will be OK inside. Do you have any tips to keep it alive and healthy indoors? And, that's it. Simple but pretty and I am enjoying it. I hope you all had a wonderful weekend and have a great week ahead. I am excited to see all my kinders in the morning and get the Christmas season underway! Their excitement at this time of year is contagious! Well, it's almost over! November that is! I can't believe how fast this month has flown by. It has been a busy one! 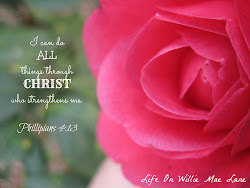 Before I share what today's post is about, I wanted to give you an update on my thyroid biopsy. I am thrilled to tell you that the biopsy was benign! I am so thankful and wanted to thank each of you for your thoughts and prayers. I definitely felt them! Now, onto the reason I am posting today. I had mentioned previously that I wasn't planning to go all out with my decorating this year due to my trip to Prague to see my daughter. I just did not have it in me to drag all my boxes in the house from the shed and then spend 2-3 days getting everything decorated. I would not have had time to undecorate before I leave since I leave for Prague on Christmas day. I also didn't want to leave it up and have to deal with it when I get home since I return home the evening before I return to work. So, I opted to not use all my decorations this year. 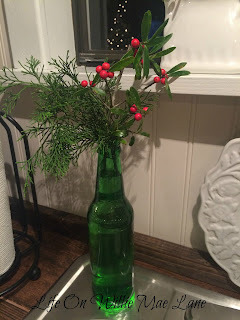 Instead, I bought a very small, real tree and wreath and then I cut branches of cedar and some limbs from some type of tree with red berries. 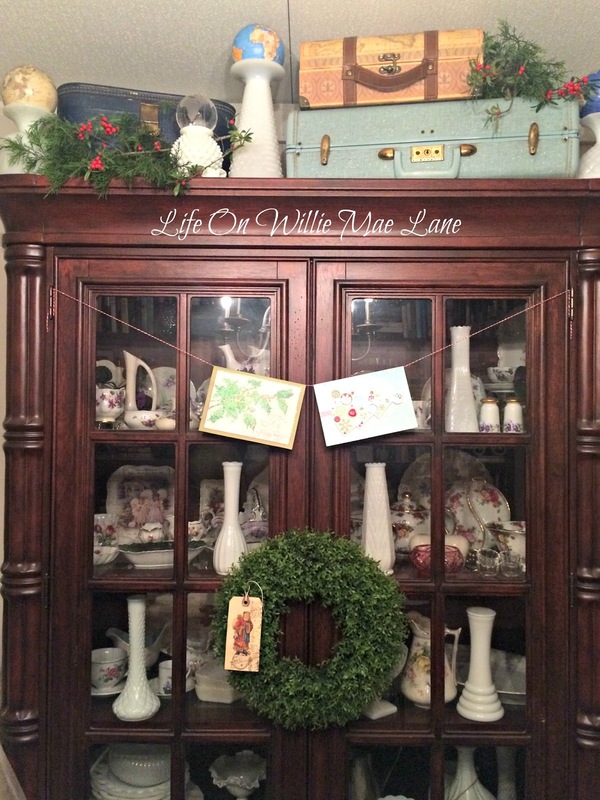 I used the theme I had going in my house since Miranda's going away party and added fresh greenery to it. 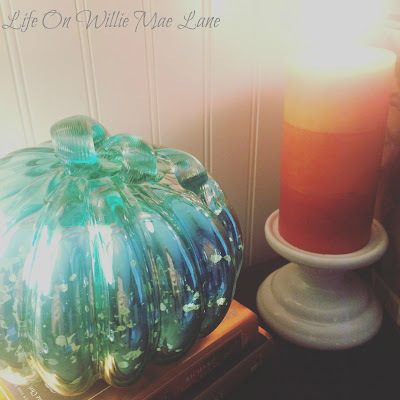 I used candles and things I had in my house. I printed a few things and made a few and called it done! My theme is Joy to the WORLD and Peace On EARTH. In light of the turmoil going on around the world, I thought this was fitting. I also thought it worked well since Miranda is across the world from me right now and I will be traveling across the world to see her soon. 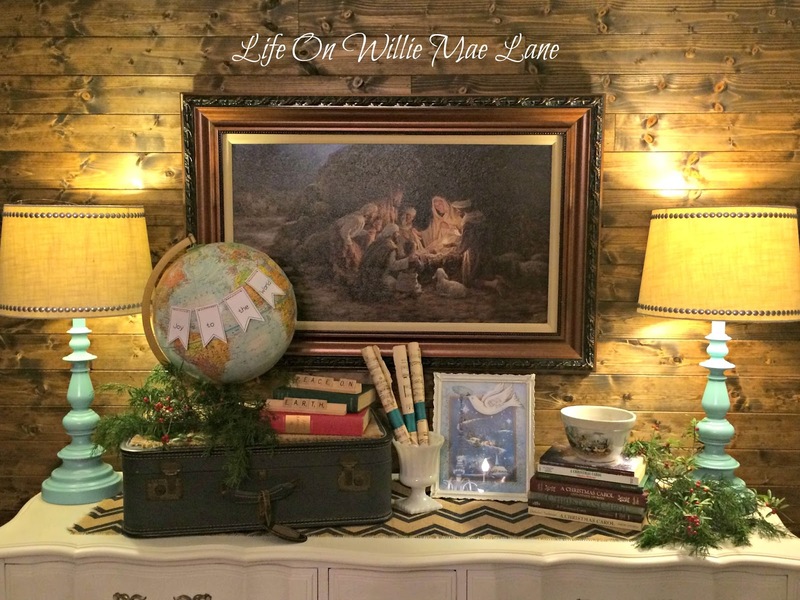 I used sheet music and maps/globes to pull my theme together. 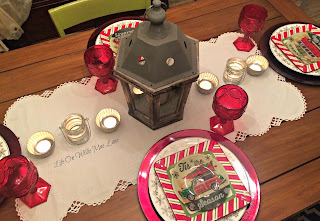 Today I am sharing my simple Christmas dining room. 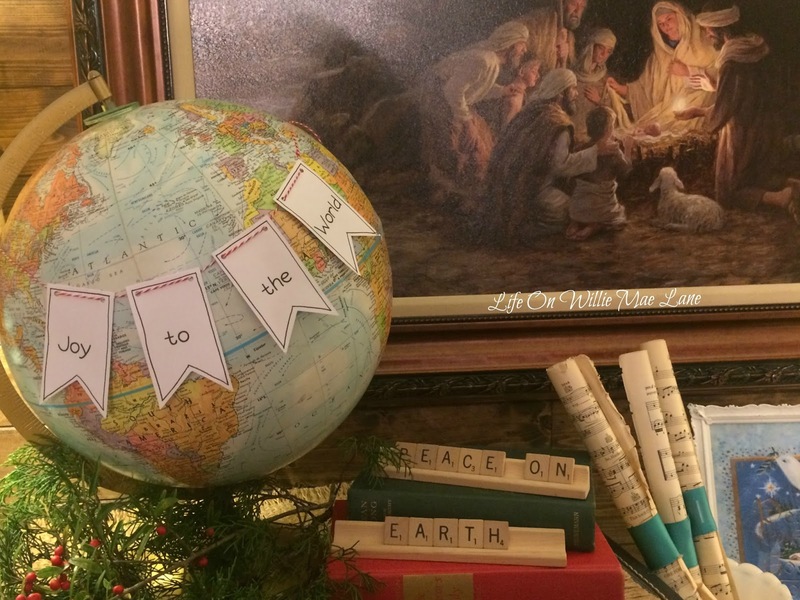 I found this adorable idea online for the cute little globe banner. I made two of these and need to make a third one. I forgot one of my globes! I used my Scrabble tiles to spell out Peace On Earth. I stacked my collection of A Christmas Carol books on the other end of the buffet. 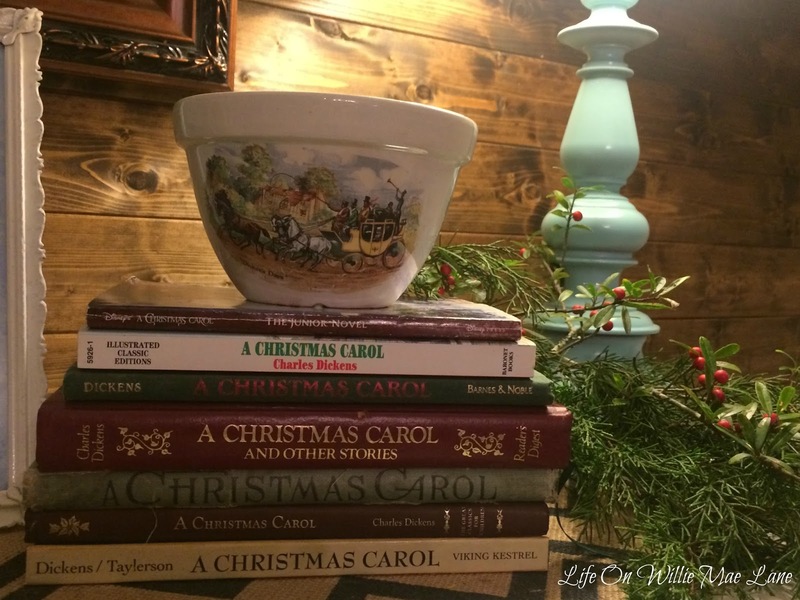 My vintage Dickens Days bowl sits on top. I found this bowl at the flea market a few years ago and it is one of my all time favorite finds! 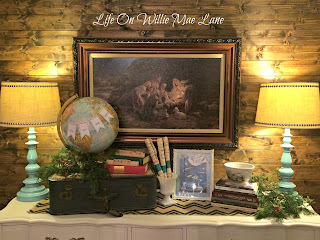 The china cabinet holds a vintage suitcase and train case and another map printed box that looks like vintage luggage. These as well as the little globes belong to Miranda. 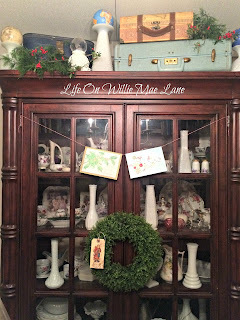 I strung a piece of jute on the front of the china cabinet to hold cards. Hopefully I will have to add another one. Here's a closer view of the top. The top center shelf of my built in bookcase just got a little greenery added to what was already there. That angel was an after Christmas clearance find a few years ago and she stays out year round. 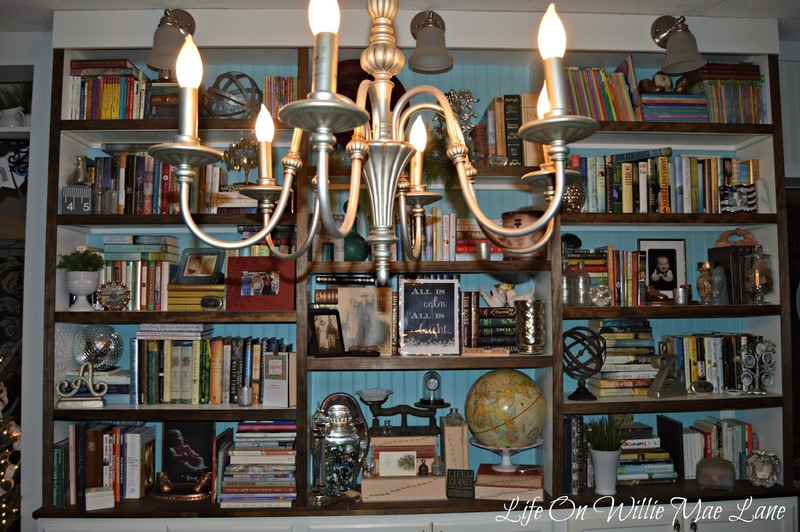 For those of you who are fairly recent readers, here is a picture of my built-in bookcases my hubby built me/ The bottom portion is cabinets and holds tons of dishes, glassware, and serving pieces. 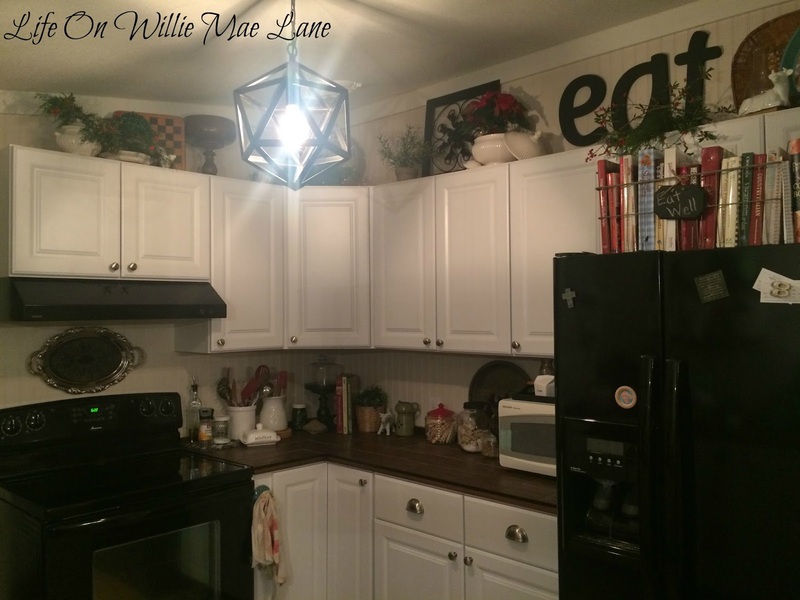 I absolutely love this unit and the fact that my hubby built it just for me makes me love it even more. He's a pretty awesome guy! He is so good to me. He loves me dearly (and I do him) and he will do anything to make me happy. Anywho, back on topic. This unit held a lot of Christmas decor last year but this year not so much. 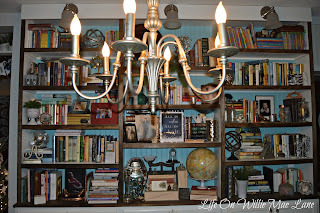 See the globe on the bottom shelf? It needs a banner. Suggestions for a different saying that Joy to the World or Peace on Earth? Maybe Let the Whole World Sing? On to the table. 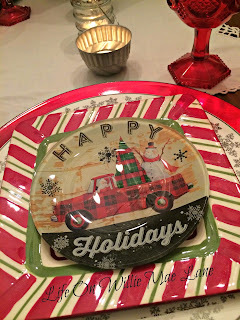 You may remember these adorable little plates I recently shared in this post. Well, here they are on my table. 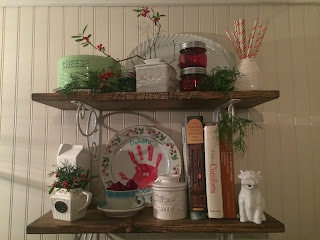 I keep my Christmas dishes in the bookcase cabinets, so I was able to get to them. I had forgotten about the white and silver snowflake edged plates I bought last year. I used my red chargers, the snowflake plates, and my square peppermint edged plates with the new plates for a nice looking plate stack. Nothing fancy and not too matchy matchy, but I love it! 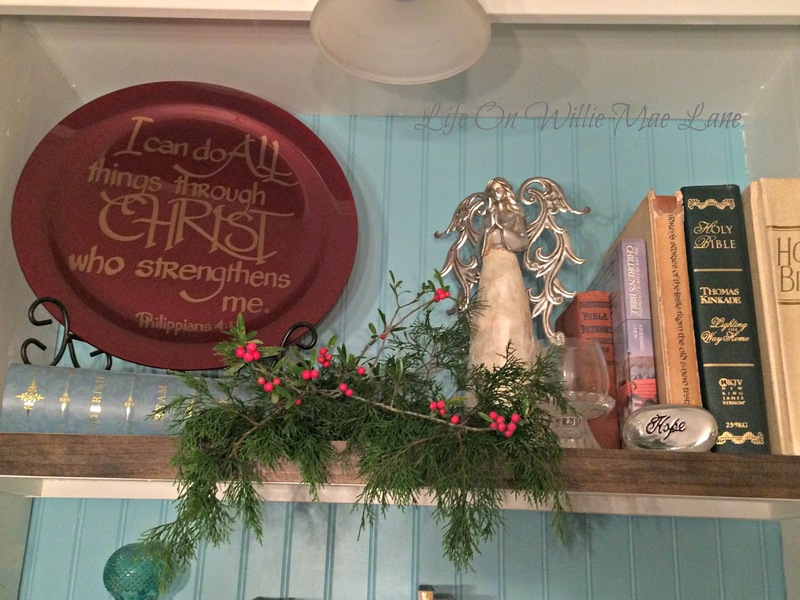 These plates are the only decor I purchased this year and I just couldn't resist them! I just love them! I want to get a vintage look truck from Hobby Lobby and tie a bottle brush tree in the back for the center of the table. Not sure if that is going to happen this year or not. I am trying to curb my spending this year due to my trip. 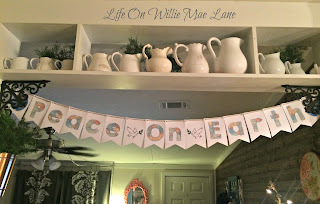 Last thing to share in the dining room is the banner I made. It is two sided and each side is different. I used vintage map images from the Graphics Fairy to make the letters. I like how it turned out. And, that is it for today my friends. I would love to show you an overview of the entire room, but right now, there is a pile of bathroom stuff in it due to a renovation we just started! It's a good thing but at the same time, I hate the mess it creates. It will all be worth it though when I have a pretty new guest bathroom. Anywho, I will be back to share the kitchen and living room soon. Have a lovely weekend! Hoping you and yours have had a wonderful Thanksgiving Day! Counting my blessings and thanking the good Lord for each and every one. 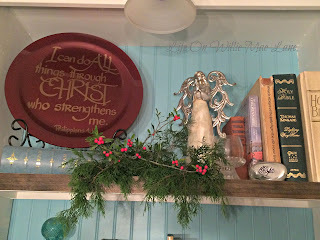 Once again I have a hodgepodge post to share today! 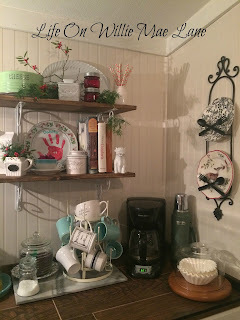 It seems that's all I share these days, but hopefully I will have some remodel posts coming up soon since we will be remodeling our guest bathroom soon and then the master. We are planning to start soon!But, for today, I will share some happies from my week. You may remember I was out of town for a workshop Sunday night and Monday. It was awesome! Tuesday I only worked a half day due to my endocrinology appointment. I met with the doctor that day but she was unable to do the ultrasound and biopsy that day so she scheduled my for Thursday morning. So, Tuesday started out at work where all the teachers received a beautiful rose as a thank you from a local resident. Then, I picked up my Mama and we went to Gainesville to the doctor. After that, we stopped by TJ Maxx. I was excited to find the perfect suitcase for my trip! I will be posting some of my purchases for my trip soon! Moving on, I went to work Wednesday and then took Thursday off to go back to the doctor. The hubby took off to go with me. I was a little nervous, but have been through this procedure before so I knew what to expect. The doctor was able to get a good sample of cells to send off. She looked at them herself under a microscope and she said they looked like normal, healthy cells. I'm praying she's right! Anywho, I only had to endure three needle sticks. The first two were not too bad. The third was a little uncomfortable because she aspirated the nodule and drained the fluid out. This took 3 or 4 minutes. She got a lot of fluid out and is hoping it might not fill back up. All this time, I was leaning back with my head down and I was getting nauseous and light headed. That was the worst part! Anywho, as long as the pathology report comes back clear, then I will not be having my right thyroid lobe removed right now. If this continues, then in a year or two, I will go through with the surgery. I will go back and see her in 6 months to reevaluate if the report shows no cancer. After we left, I did a little shopping at Tuesday Morning, Target, and JoAnne's. I was so excited to find these adorable plates at Tuesday Morning! I can't wait to set a table with them! They are just small dessert plates but will look cute stacked on some plain red, green, black, or white plates. Not sure which one I like best! The hubby likes the truck the best. I just can't decide! I found a few crafty things there as well. The gold and black Christmas stickers are actually from Target's Bullseye's Playground...formerly the Dollar Spot. 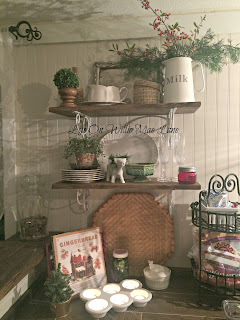 I got a great deal on the Tim Holtz products! The small paper is travel themed and will be used to document my trip to Prague! Here are the Target and JoAnne's goodies. The little trees and rhinestones are from JoAnne's. The 3-pack of red jars was just $3 at Target. They also had bigger ones. I bought some trims from Target too. They had lots of great items for Christmas for $1-$3. These were $3 each at Target. I am planning to use them to hold fresh greenery for Christmas. I will probably hang one on the door. I love the copper colored one! They are flat on the back for hanging. I couldn't pass them up! It was an awesome movie! I always like movies that are based on real life events. I'm sure you remember when the copper and gold mine collapsed in Chile back in 2010. Unbelievable that these men lived for 69 days underground. I highly recommend it, but take some tissues! On to Friday....I went to work and had fun making some Thanksgiving things with my kinders. I completed my lesson plans and a few other things after work for when I return on the 30th. I came home and got ready to go watch my nephew and our local football team in a district playoff game. We lost, but our boys sure played with heart! Saturday morning I went to see my hairdresser for a trim, came home and the hubby and I went to pick up a new bathtub for the guest bathroom, and then we went to my mother-in-law's to visit. She has a tangelo tree growing in her backyard and it has lots of fruit this year. They are so sweet and juicy! We picked several to bring home. I had to take a picture of this gorgeous and unusual flower. They look like raspberries before they open up. So cool! The little lavender blooms remind me of bells. My mother-in-law used to make crafts to sell. She still makes a few things but she has been trying to downsize her craft supplies over the past year. I went in her shop and rummaged around and she gave me what I wanted. 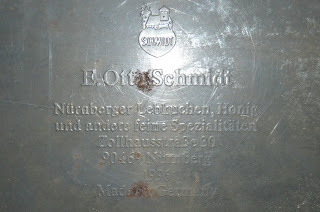 Look at this beautiful biscuit tin she was storing things in! Isn't is gorgeous? It is quite large too. That's my sewing chair it is sitting on and it is pretty wide. 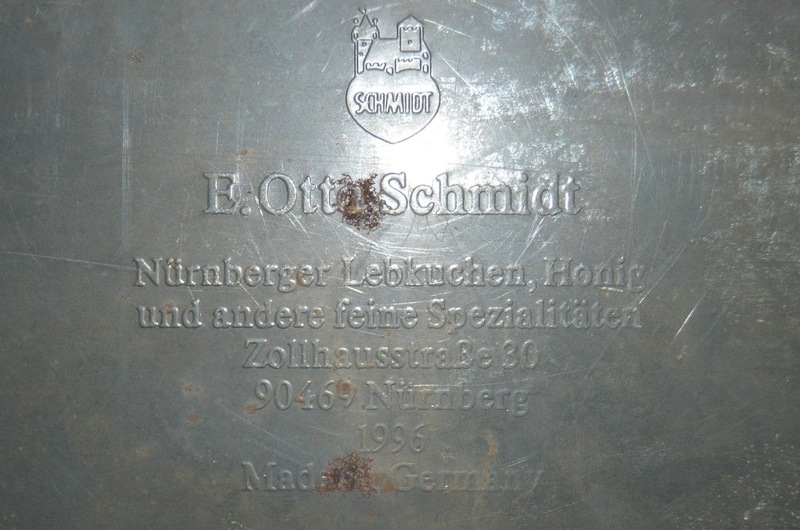 The tin was made in Germany. I cannot read what it says but I was able to fin some similar ones on Etsy going for $30-$60 something dollars! I will be keeping mine and probably storing whatever I am currently working on in the living room. She gave me a box full of different size Styrofoam balls. I just went to Michael's last weekend and paid around $3 or $4 for 6 and that was with a coupon! I'll be returning those now! I have the tin crammed with several yards of fabric, fringe trim, a small tree for my kitchen shelves, a pink feather boa, pearl trim, chenille stems and so on. I need to find homes for all of it! Not the best picture, but she also gave me this metal basket. It looks like it is designed to go on a bike, but I have other plans for it. It is really neat! And, that my friend, is it. Sorry this was so long! If you stuck around to read it all, thank you! I hope to be able to post a couple times over the break. I am so happy to have this week off work. I have been needing a break. I want to thank you for your thoughts and prayers for my thyroid. Hopefully I will have results soon. I thank you for your thoughts and prayers for Heather too. I saw her last night and she is doing better. Her most recent x-ray on her lung showed improvement. You all are the best! I hope you have a wonderful week ahead.